I don't know about you, but I'm always looking for new fruit and veggie side dishes to serve with lunches and dinners. 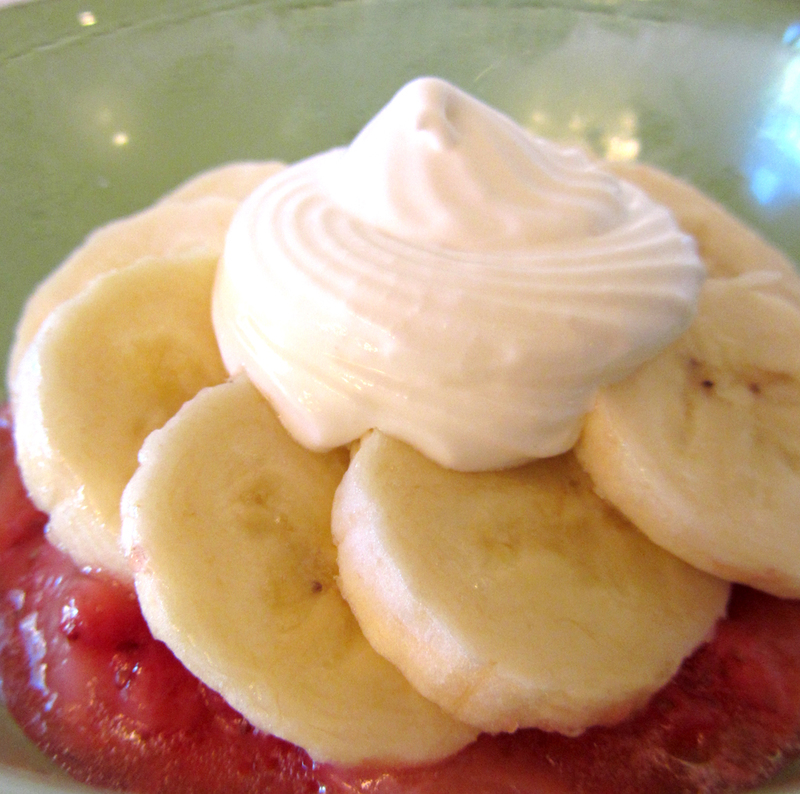 This salad (which could double as a light dessert) is a lovely blend of strawberries and bananas, topped with a sweetened cream cheese dressing. It is the perfect accompaniment! 1. For the Strawberry Gelee: get ready 6 small bowls. 2. Stir the water and gelatin together in a small bowl. Let stand for 5 minutes. 3. Microwave the gelatin mixture for 20 seconds and stir until completely dissolved. 4. Meanwhile: stir the strawberries together with the sugar and 1 tsp liquid in a medium bowl. 5. Stir the gelatin mixture into the strawberries until thoroughly mixed. 6. Evenly distribute the mixture into the bottom of the bowls (about 1/4 cup per bowl). Cover and chill until set and ready to serve (mixture will not be firm). 7. Meanwhile - For the dressing: in a medium bowl, beat together the cream cheese and the marshmallow creme. Cover and chill until ready to use. 8. To Serve: slice the bananas. Evenly distribute the slices on top of the gelee in the bowls. Spoon or pipe equal amounts of the dressing into the bowls (about 2 tbsp ea). Serve!